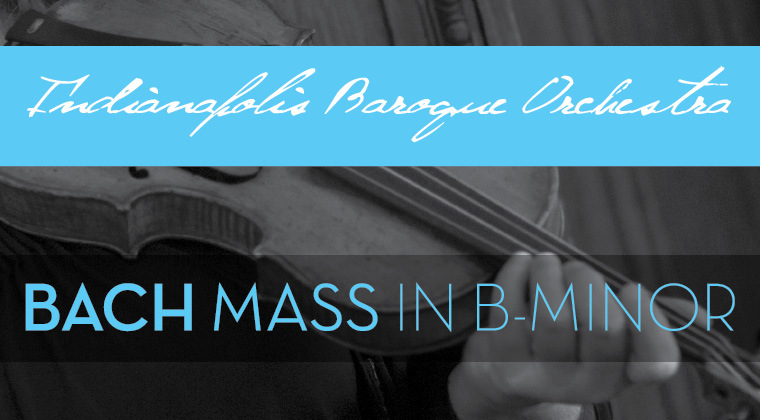 The Indianapolis Baroque Orchestra, along with the Spire Chamber Ensemble of Kansas City collaborate to present a monumental work of choral music, Johann Sebastian Bach’s Mass in B Minor. Hailed as one of the greatest musical compositions of all time, Bach’s musical setting of the complete Latin Mass is not only a synthesis of Bach’s stylistic and technical gifts, but a tribute to his deep spirituality and to the most personal theological traditions of his daily life. This work, with its masterful combining of the Catholic and Lutheran liturgy, is the subject of much scholarly work not only about its form and composition, but even about the origins of its first performances. Particularly fascinating is Bach’s adaptation of already existing vocal music throughout the piece…the work constantly and consistently inspiring the listener with new life given to vocal music that Bach had previously composed. Admission: Adults $20, Seniors $15, Students $10.